Aebleskiver (singular: aebleskive) or ebleskiver (sometimes spelled ebelskiver) are a type of Danish pancake puffs that are cooked in a special stovetop pan with half-spherical molds. 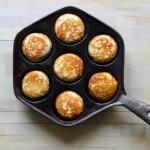 The pan, often called monk pan or aebleskiver pan, typically features 7 (or 9) indentations and is now made of cast iron. 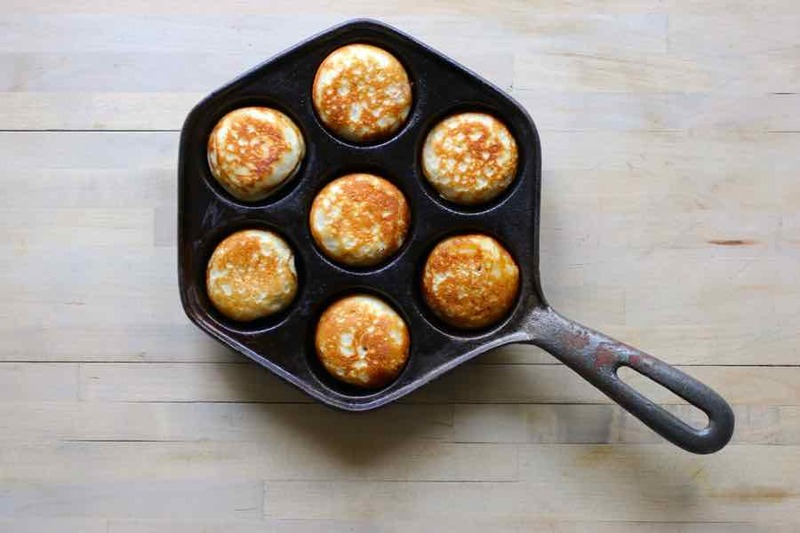 The cast iron aebleskiver pan exists in versions for gas and electrical stoves for which it features a plain bottom. The earliest known aebleskiver pans are more than 300 years old and were made from hammered copper. Aebleskiver means “apple slices” in Danish. The name indicates that there were apples in the original aebleskiver recipe. However, modern versions of aebleskiver do not include apples. When and where are aebleskiver served? Aebleskiver are typically not served in restaurants or for breakfast, but they are rather served at the family table for afternoon coffee breaks. In Denmark, they are common during Christmas and over the days leading up to it. 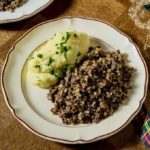 During that time, they are often served with gløgg, a Scandinavian mulled wine. What are the versions of aebleskiver? There are two categories of aebleskiver: those made with baking soda (or baking powder) as a leavening agent, and those made with yeast (gaer aebleskiver). 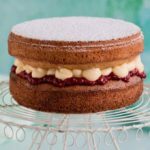 The latter produce a fluffier and more airy end result. The aebleskiver recipe I am sharing with you today is the version with baking soda and buttercream also called kærnemælks æbleskiver. Another version with cream is called flødeæbleskiver. Aebleskiver are traditionally served rolled in powdered sugar, sometimes with whipped cream, butter, maple syrup, and also very often with fruit preserves or jams such as raspberry, strawberry, blackcurrant or blackberry jams. 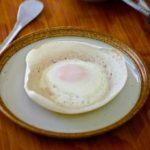 What is the origin of aebleskiver? during the time of the Vikings, when they roamed the coastal waters of England and the Atlantic, some of those Vikings were hard hit in battle. As they returned to their ship, they made pancakes with their badly dented horn helmets and shields. As they didn’t have proper cookware, they greased their shields and poured the batter on them over a fire. There are quite a few reasons why this story may not hold true, including the fact that Viking shields were partly made of wood! The Dutch make similar pancake balls, although more ovoid in shape, called poffertjes. Like aebleskiver, they are made in a special pan. It is as unclear which came first between the chicken and the egg as it is between the poffertjes and the aebleskiver! Pancakes are breakfast and brunch favorites, and we have featured quite a few on 196 flavors already, starting with Empress Sissi’s favorite, Austrian kaiserschmarrn! 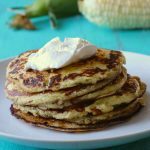 Other pancake recipes have included Costa Rican corn-based chorreada, traditional potato-based Irish boxty, or millet-based crepes from Benin. If you are in a savory kind of mood, you should definitely go for my personal favorites: maize flour-based pupusas from El Salvador. 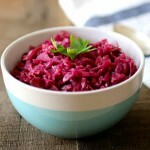 But you can also try latkes or for the more exotic taro rosti from Palau in the Pacific. I made these aebleskiver a couple weeks ago for Sunday brunch. 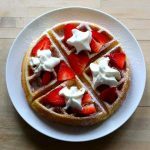 My kids helped me make the batter and suggested different toppings, including jam, as well as some less traditional like agave syrup and Nutella! 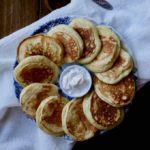 These pancake balls with a soft and fluffy center and a crispy outside are as unusual as they are delicious. 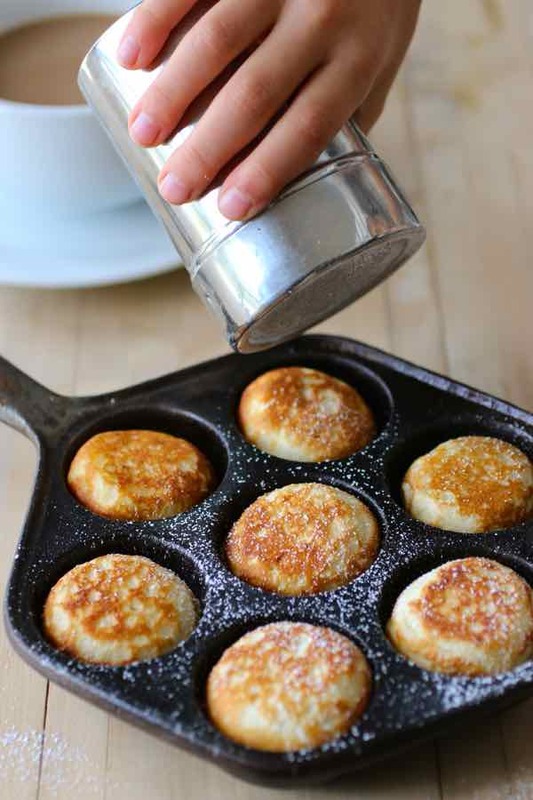 Get yourself an aebleskiver pan and try them! Aebleskiver are traditional Danish pancakes that are cooked in a special stovetop pan with half-spherical molds. Beat the egg whites with the sugar until stiff. In a separate bowl, whisk the egg yolks, flour, baking soda and salt. Add the buttermilk gradually while mixing. Continue mixing until reaching a homogeneous consistency. Slowly add the melted butter while mixing. 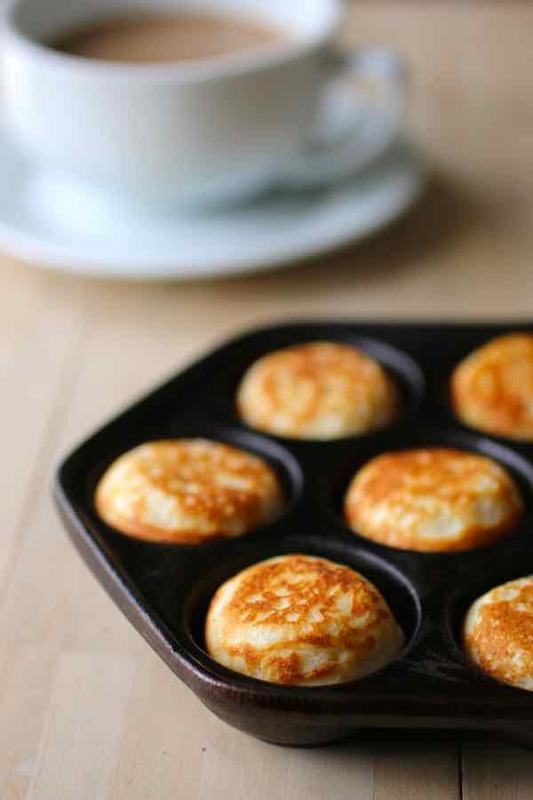 Heat up the aebleskiver pan at medium heat. Grease each hole with a little bit of butter or oil. Fill the holes with the batter. After a couple minutes, turn the aebleskiver over with the help of a toothpick. 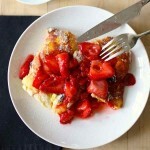 Dust with powdered sugar, and serve with jam or other favorite toppings. We make these for Christmas dessert and serve with strawberries and whipped cream. My grandfather was Danish so we honor him. Hmmmmm. Sounds delicious Marilyn. Hope you had a wonderful Christmas celebration. I have a aebleskiver pan and I have a very difficult time trying to “flip” or turn over the puff pancakes. Is there special technique that I need to learn? 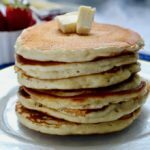 Hey Robert, so the technique is to use a toothpick, and to flip them but not entirely so the batter that is not entirely cooked at the top slowly drips to the bottom for 30 seconds, then use the same toothpick to flip them entirely. That way, the aebleskiver are nice and round. Good luck! I use a skewer because it is longer and away from the heat. Turn the aebleskiver one quarter turn at a time. They will cook through and will be round. Enjoy. I use an anitique hat pin! Hello from Denmark. The trick to make your Aebleskiver perfect spheres is to start turning them, when thet have a good Brown and solid outer Shell of the Half-sphere and still running dough in the center. When they have this consistency use a knitting needle or a bamboo skewer to turn the aebleskive 90 degrees. The old surface of the Half-sphere is now vertical in the hole. Now 1/4 of the sphere is still missing. Turn the Aebleskive so there is only 1/8 of the sphere missing. And close the last 1/8 gap in last turning. Of course let the Aebleskive turn Brown and the surface stable between turnings. 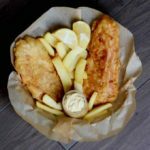 This trick takes lots of practice, and some fine-tuning of heat, volume of melted butter or lard, volume of batter and the ratio between baked and raw batter, but it Can be done. These type of spheres are difficult to fill with eg. apples, prunes or other non traditional filings. Aebleskiver are traditionally served with suger and jam. Greetings from Nina in Denmark. Thanks for your advise. I have been making them for years but never quite got them round…now I can! The Snaps sounds wonderful too. I’ll have mine with Apricot please. Hey Ellie, I am not sure you will be able to get enough contact with the cast iron pan to heat it properly unfortunately. The recipe i have calls for mixing the sugar with the egg yolks, not the egg whites. Do you think it makes much of a difference. we do not add butter to the recipe either. hmmm i may have to try your recipe to compare. I love these. I make them every Christmas season. I make these “little danes” as my grandmother called them, on the weekends when my grandkids come over. I make a double batch and freeze 1/2. I use an ice pick to turn them with. 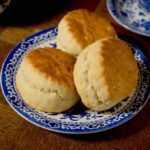 My recipe is slightly different and has been handed down over the generations. Great grandparents immigrated from Denmark . Thanks for sharing, Deborah. 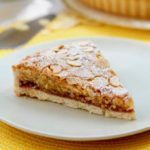 How different is your recipe?